In transfer moulding operation, the rubber flows from a separate reservoir through flow channel, called a sprue, into mould. 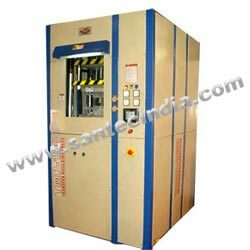 By using transfer moulding presses produced by Santec there are three advantages over compression moulding presses. As the mould is closed before the rubber charge is forced into it, closer dimensional control is achievable. In the transfer process, fresh rubber surface are produced and this allows development of a strong rubber - metal bond with any insert in the mould . Unit production costs are lower due to shorter cure times as a result of heating the rubber due to flow through sprue, runner and gates & shorter downtime between runs, as only one charge blank is necessary, even if a multi cavity mould is used. The clamping / closing of moulds is done by hydraulic cylinder mounted in reverse direction on the fixed platen of the machine hence giving downward & upward movement to the 4-pillars in place of platens. After clamping of moulds by main clamping cylinder, the main injection cylinder mounted at the top of the pillars, Transfers the preheated rubber inside of the moulds with the help of runner & gates provided in the specially designed moulds. Side core pullars are also provided in the presses to mount middle part of mold. Clamping force & injection or transfer force created by the clamping & Transfer cylinders are acting in one direction (downward) so product produced is having less wastage, rejections which is not possible in other conventional transfer molding presses, where clamping & transfer forces are acting in opposite directions.